Yes I forgot about that bus too. That was pretty cool to see that bus in the movie. You also see the Flxible stopped as the firetrucks are running up Milwaukee towards North ave. I have a question on something that was in the 4 part series of magazines from the Motor Bus Society. On page 17 in the part 4 magazine, there's a picture of a bus #1447 with a front bumper that is black rubber. It has cuts in it that makes it unique. ( I never seen that before on #1000's) Did the #1000's come with rubber bumpers or what? What am I seeing? Also on Busdrawings.com #7400 has a black bumper as well, but the MBS books show #7400's just after delivery without this. I know #9000's and above has rubber bumpers as standard equipment, my question is mainly on the #1000 and #7400's. Any comments? That's not unique. The last about 100 of the 1000s were delivered with a rubber bumper, with water (or maybe some antifreeze) filled compartments. Apparently it was a test that didn't work out. The solid rubber bumpers on any 1000s or 7400s were aftermarket. Speaking of GM Fishbowls, I found a youtube video of a Fishbowl from New York that should bring back memories of the transmission noise. I've only ridden a fishbowl a few times, and I guess this is the sound I remember. I believe the numbers were from 1426 up through 1524, with the exception for 1518 (for some unknown reason). They were eventually removed. I remember the GMC Fishbowls with the rubber bumpers that look like teeth. And also I wondered how has anyone noticed the foward area on the drivers side at the bottom, the area just forward of the front tire how the body panel is straight and then later that area is angled? Im sure the buses were getting dinged up in tha area. And also I wondered how has anyone noticed the foward area on the drivers side at the bottom, the area just forward of the front tire how the body panel is straight and then later that area is angled? Im sure the buses were getting dinged up in tha area. Noticed it too, including how many were dented. I know that later ones of that model had an angled bottom, but don't clearly remember if that applied to the 9000s and 9600s. While surfing another forum, I think I found the answer to this question. 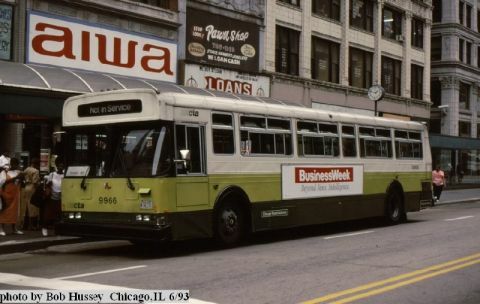 It seems there were 15 #800 series West Town buses (former RTA) that were sent to Fg for a few months in late '82 - early '83. It seems to make sense to me. These buses were dark blue and West Towns colors were dark blue. Seen pictures of old West Town trolleys and they were the same color. If you want to see the story it is at finance.groups.yahoo.com/group/CHICAGOTRANSIT/message/41557 Also while on the subject of West Towns, I seem to recall a GM fishbowl in the early 80's that used to run outside Brookfield Zoo on possibly the #331 ( I'm not sure what route). This bus was painted to look like a cheetah or some kind of cat. It had the spots on the animal and everything. It always used to pass by on Washington St. at the south gate and turn and go North on 1st Avenue. Does anyone remember anything about this? Hey CTA5750, I know I shared these with you, but I thought maybe the others would like to see. That was cool looking bus! I wonder if anyone has video to hear the sound of the engine. 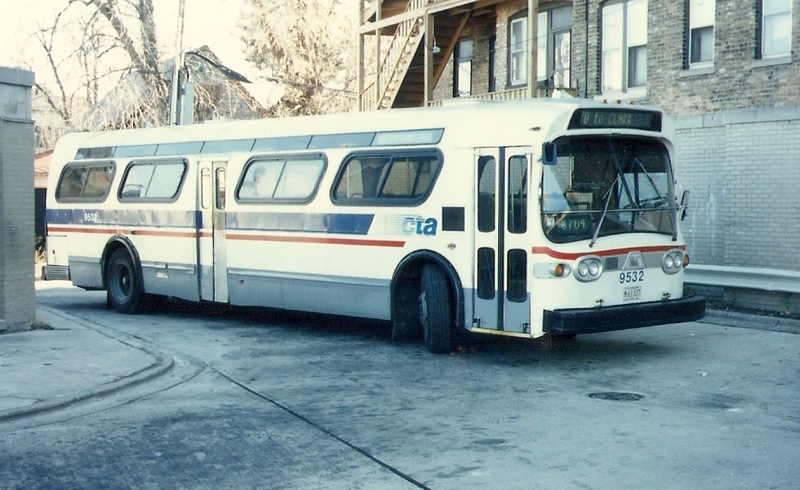 The odd looking fishbowl that served at FG and among the Lawndale/Chicago routes with the rebuilt rear because it's original one was destroyed in an accident. Sweet. This is the bus I and others remembered seeing in the 90s that other members questioned if it existed in revenue service. I had remembered it had rear parts of a TMC but as we can see some Flyer D901 parts also made their way into the rebuilt rear assembly. Did this bus come with the Flip-Dot displays on the front destination sign and run number, or was that an add-on after the rebuild? No fishbowl ever was delivered with flip dot displays. There all add ons. 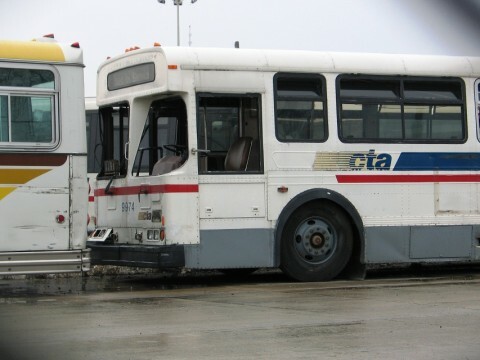 Much like how 9974 had a flip dot headsign and side destination sigh as add ons for a short period before they put standard roll signs back in it when they swapped its darked out windows back out for ones that were standard for CTA D901s. During that short period I looked on 9974 as FG's imitation Americana I remember they also had its gear sequence as it accelerated switched to that of an Americana. Hmm... I must have missed that about the tinted windows. I knew the windows were tinted, but I never knew they were removed. 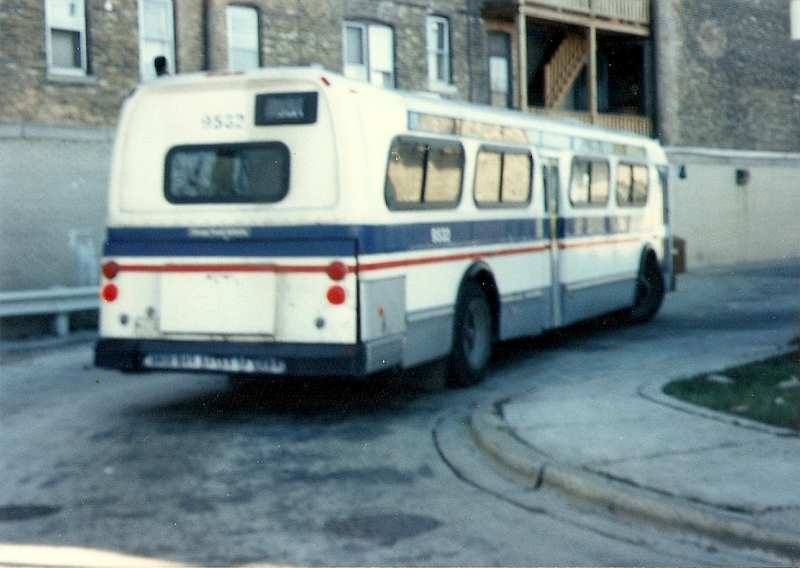 I know #9532 and #9974 were some sweet buses when they were just released for service. By the time #9532 left FG for Chicago it started getting wrote up/vandalized and it was not pretty too see. Even #9974's use was limited at 77th, probably because they were concerned about the same thing. #9974 did retain most of it's black painted window frames almost all the way to the end. It's funny we don't have more pictures to post of #9974. It was definitely worth it!! Looking closer, the black square behind the front door isn't explained, but directs the eye to the fact that the wedge window usually there on a GMC isn't, which makes it more like a 3000 series Flxible. Also, the windows have black frames. I did not notice that about the wedge window behind the front door not being there until you mentioned it. So it appears this bus was more a Frankenbus than we thought. And yes Bushunter, the tinted windows on 9974 were gone by the time it was retired. It did still have remnants of the black frames still but just barely. The black around the window frames were just about faded late in the bus's life as a revenue vehicle. It looks still noticeable in this photo when it was awaiting scrapping at 77th. I see. Man I remember when they wwre still creeping around. I'm only 18 but time flew. I know. 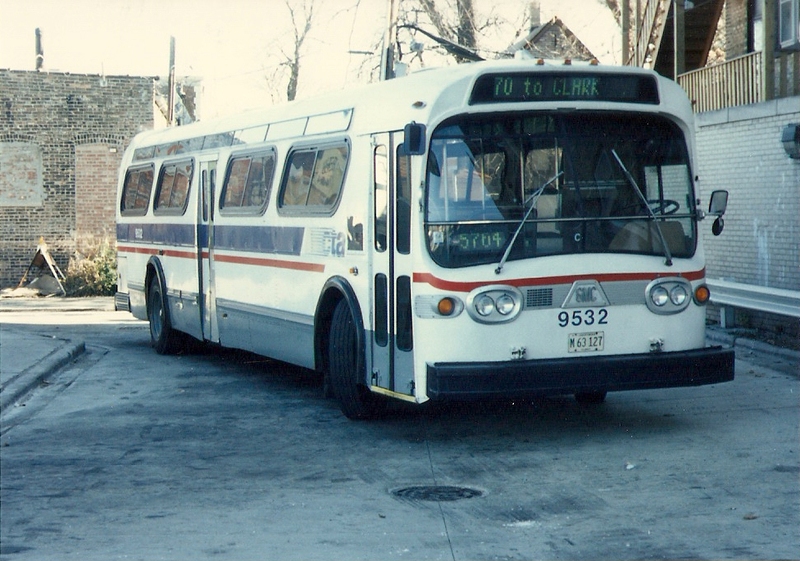 I remember the Belmont route back in that day, and I remember almost always getting one of these buses back then. I remember the sound of the Detroit 6V92TA it had(I'm not sure of the transmission it was paired with, but I'm guessing it was a ZF) as it accelerated and whined as it shifted from 2nd into 3rd gears. Yeah your right SW4400. Plus when you zoom up the picture you linked to, the windows are still tinted. I took one of the last rides on that bus in revenue service in 2001 and the windows were unchanged IIRC. There may have been one or two windows changed out but the bus was basically unchanged.